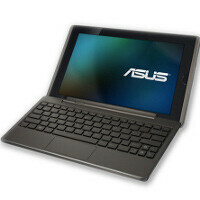 Amazon UK has made the 16GB version of the Asus Eee Pad Transformer available for pre-order for $620 (£379.99). Its launch date in Britain is listed as April 18, and you can also buy a docking station along with the tablet - as this dock is actually a keyboard, it turns the Asus Eee Pad Transformer into a full-fledged laptop. The combined price of the tab and the docking station is $702. It's not known when the tablet will be offered in the States, although it briefly appeared on Best Buy and Newegg - that's, before it was suddenly removed from their sites. Nevertheless, it's interesting to note the Asus Eee Pad Transformer was priced at $399 by these US retailers, which sounds like a bargain for a tablet powered by a 1GHz Tegra 2 processor and Honeycomb. Not only that, but the Asus Eee Pad Transformer offers a 10.1-inch screen with a 1280 x 800 resolution, two cameras, 1024MB of RAM, 16GB built-in storage and a battery life that's rated at the impressive 16 hours when the keyboard dock is connected to the tab - these are good specs any way you look at them. Why are you all using USD for UK prices? Tech items usually translate as 1 to 1 price wise. It's really stupid to keep doing this. Cost aside, this is a step in the right direction for tablet manufacturers. Great looking device, tablet functionality, exceptional battery life and good software. Only drawback now is memory. Who can realistically function with only 16GB? Even if they offered a 64GB version it would barely make it laptop replacement. We should be looking at a minimum of 128GB or 256GB to 500GB memory capacities to make it a real laptop/pc replacement device. damn £379.98 & this item Delivered FREE in the UK with Super Saver Delivery. See details and conditions You Save:	£0.01 This item will be released on June 1, 2011.